On November 18, 2013, the Oxford English Dictionary pronounced “Selfie” the word of the year. Since then, selfies have assumed a place of privilege in the dialogue concerning how digital media affects behavior. For many, taking selfies is simply a harmless past time. As with Polaroid, it is considered little more than a method for capturing a moment in one’s life and sharing it with others. Conversely, selfies are also seen as symbols of the deteriorating moral fabric of civilization; harbingers of a future digital media dystopia in which disassociated individuals callously pose before human atrocities to snap and share the pic. While selfies, such as “RIP Grandpa Wu,” may evince a certain callousness and indifference to behavioral norms, they also reveal an associative realignment. [Fig. 1] This realignment moves the onus of experience away from phenomenal engagements with adjacent strangers and towards digital interactions with online communities. The former tend to be ruled by pre-established codes of conduct that ensure civility in place of familiarity; the latter rely on more itinerate and fluid systems of mores developed within (or adopted by) online associative networks in the process of formation. Figure 1. 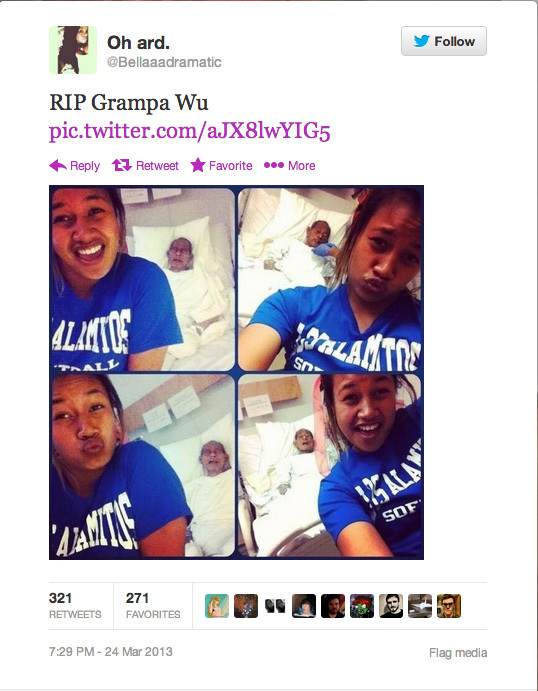 @Bellaaadramatic, “RIP Grandpa Wu,” Twitter post, March 24, 2013, 7:29 p.m. Yet, the very fact of a fissure implies a primary connection, a continuum in which a cleft has been rent, the persistence or memory of which reveals the fissure as such. Phenomenal engagements feed into digital interactions, just as the latter feed back into the former, each informing the other in an ongoing system of recursion that implies a certain continuity between the two. The digital and phenomenal aspects of contemporary group dynamics are thus more indicative of interpenetrating ecologies than they are of separate planes of experience. Weaving these ecologies together is the electronically extended self and its iconic online avatar, the selfie. As McLuhan argues in the quote that opens this introduction, technological prostheses (like smartphones) affect the individuals who appropriate them – the electronic extension of individual consciousness results in a new kind of self-consciousness. This, in turn, effects the articulation of the digitally extended self through networked ecologies. A new system of recursion emerges in which the synergistic coupling of the individual and the ecologies that he/she inhabits results in an indeterminate variety of possible permutations, as each inflects the other. This essay attempts to trace the relationships between selves, selfies and the ecologies they inhabit. It does so in an effort to develop a framework for understanding the critical recursions that inform identity creation in the extended digital/phenomenal field of contemporary networked environments. The first section of this essay explores the notion of “media ecologies” through the lens of evolutionary biology, in which the term “ecology” originated. Sections two and three extend this analysis to the concept of the “technological phylum,” with a particular emphasis on imaging (and self-imaging) technologies, up to the advent of the digital selfie. The fourth section examines the dynamics of identity construction as expressed through the relationship between digital selfies and the electronic networks that they occupy. In the final section of this work, the theoretical scaffolding articulated in the previous sections is applied to the analysis of particular selfies in an attempt to reveal the mechanisms of online identity construction as expressed through the use of selfies online. As McLuhan and the graphic designer Quentin Fiore show us in The Medium is the Massage (through images of circuit boards, phonographs, books, film stills, newspaper clippings, mirrors, clothing, railroad tracks, etc. ), media are always embodied, and, as such, materially constrained and specific. This includes invisible media, whose agencies are circumscribed by both the physical infrastructures necessary for signal transmission and reception, and the electromagnetic wavelengths of which signals are comprised. Today, this invisible continuum of electromagnetic signals function like Newton’s luminiferous aether. Newton’s theory of the aether conflates the singular and plural connotations of medium and media through the equivalency of a universal substrate of interactivity with the various media (electromagnetic spectra – Newton’s waves and rays of light) through which the aether is scientifically observable and subject to experimental verification and mathematical exposition. The work of mid-century information theorists, such as Claude Shannon, evince a similar tendency to conflate the plural and singular connotations of media and medium. However, while Newton’s theory of the aether maximized visual media by translating them into the principal medium of interaction, Shannon minimized media plurality in an attempt to establish universal standards for electronic telecommunication. While work by figures such as Shannon has proven instrumental to the implementation and on-going development of large-scale information infrastructures (like the internet), the insistence on the performative parameters of communications technologies evinces a tendency towards media solipsism in which the connotations of text, sound, image and film technologies are subsumed by the translation of media-messages into signals suitable for digital transmission. This tendency is clearly expressed by Warren Weaver in his introduction to Shannon’s Mathematical Theory of Communication, in his claim that from the perspective of communications theory the English language is 50% redundant – a claim that, in lieu of the uniquely truncated forms of English developed for contemporary digital communication, may seem an under-estimation.7 The consequence is a general subversion of media, and a proliferation of formats (doc, mp3, jpg, pdf, mpeg, avi, etc. ), developed to meet the performance requirements of compression, data-exchange rates, RAM and the constraints of digital infrastructures for data transmission.8 Data has come to replace, in many instances, the nuanced differentiations in meaning between media, with the internet assuming the position of Newton’s luminiferous aether, and standing as a universal principle of communication. For Lamarck, a milieu represented a unique physical substance (water, air, light), the perpetual workings of which inform the gross morphological characteristics of creatures. In Lamarck’s theory of evolution, developmental adaptations are always materially and environmentally constrained and specific to particular milieus.10 According to Lamarck’s evolutionary model, the unique characteristics acquired by an organism as a consequence of its imbrication within particular milieus may be transferred to that organism’s progeny, a process known as epigenesis. This model of milieu was adopted and extended by Ernst Haeckel in his definition of ‘ecology.’ Haeckel coined the term to include not only the material affects of environmental media (like water, light and air), but also the various plant, animal and geographical datum (temperature, geology, etc. ), all of which impinge upon the morphological articulation and survival of living organisms. In Haeckel’s terms, the matrix of forces that comprise an organism’s ecology define the conditions to which that organism is “adapted.”11 As such, ecology delineates the formational concatenation of media affecting organic evolution through their persistent influence. Haeckel’s incorporation of the Lamarckian model of milieus combines systems of Darwinian selection with those of epigenesis. In essence, Haeckel argued for a hybrid evolutionary model, in which the randomness of organic inflection described by Darwin is informed by the immersion of an organism (or group of organisms) within established associational and material networks. Haeckel’s theory of ecology helped to describe the transformational forces inflecting organic evolution. Haeckel introduced a second concept to account for the persistence of form over time – the biogenetic law. 12 In its simplest formulation, this law states that ontogeny (the current morphology of an organism) recapitulates phylogeny (the historical forms of the phylum). 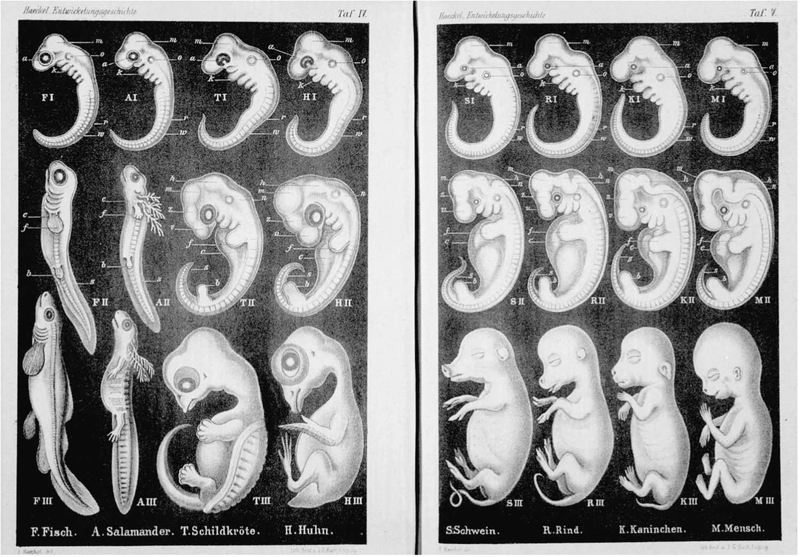 Haeckel illustrated this law through an embryonic sequence, in which each stage of gestation is marked by a different set of phylogenetic (historical) attributes, until the current morphology is achieved. [Fig. 2] This gestational process serves as a limiting factor for morphological deviation, even as the various and variable forces of ecology work towards increased formal differentiation. Haeckel’s theories of ecology and recapitulation thus account for both the historical continuity of form represented by an organism’s phylogeny, and the subtle variations evinced by an organism’s ontogeny (emergent form). While the particulars of Haeckel’s theories have not survived the maturation of the biological sciences, the fundamental forces that he described are still an integral aspect of contemporary evolutionary and ecological science. At the genetic level, the genome designates the inherent biological limitations informing an organism’s capacity for mutation or evolution; it serves as both a variable matrix allowing for possible evolutionary transfiguration and as a historically developed system of recapitulation tying organisms to their genetic inheritance. Conversely, ecologies, which describe networks of association ranging from gross regional traits, such as climate, geology and topography, to intimate biotic communities, such as those defined by food relationships, provide the environmental context for potential future adaptation, as constrained by systems of Darwinian competition. Applied to what might be called the technological phylum, Haeckel’s concepts of ecological evolution and genetic recapitulation help describe both the inherent historical inertia of media, and their capacity for emergence. Thus, the evolutionary potential of any medium is defined by myriad variables innate to the medium as such, including its material composition, underlying organizational paradigm and/or unique functionality. In addition to these intrinsic evolutionary parameters are the extrinsic forces of media ecologies, such as material availability, the advancement or extinction of certain forms of manufacture, the emergence of competing or complementary media paradigms and the development and maintenance of vital infrastructures. The same might be said of media artifacts, like the selfie, whose recent abundance represents a confluence of emergent media (smartphones and tablets), more spatially distributed and faster wireless networks and pronounced cultural proclivities towards online self-representation and construction. The later have been encouraged through the popularity of social networking sites like Facebook and Twitter and the app ecologies that increasingly support them. Yet, even as selfies are enmeshed within emergent paradigms, such mobile computing and social networking, they also evince a tendency towards technological and aesthetic recapitulation, including the use of filters that mimic older photographic technologies or the recurrence of well-established and popular aesthetic tropes. This reassertion of traditional forms not only retards the evolutionary progress of the selfie, but also informs the emergence of new paradigms. In Understanding Media: The Extensions of Man, McLuhan argues that “the ‘content’ of any medium is always another medium.”13 Thus, the content of daguerreotypy is painting, that of photography, daguerreotypy, of Polaroids, photography, and of smartphones, the Polaroid. In each instance, the media artifacts emblematic of each medium equivocate between the unique productive potentialities of the medium and the recapitulated history (technological, cultural and aesthetic) out of which they emerge.14 Furthermore, in each instance, the introduction of a new medium radically affects the preceding ones. Thus, daguerreotypy advanced a type of “objective” fealty to the subject, stationed in the particular perspective engendered by the technology – by the weight and size of daguerreotypes, the exposure times and sizes of photo-sensitive plates, the aspect ratios and fidelity of lenses, the aiming angles of tripods, etc. [Fig. 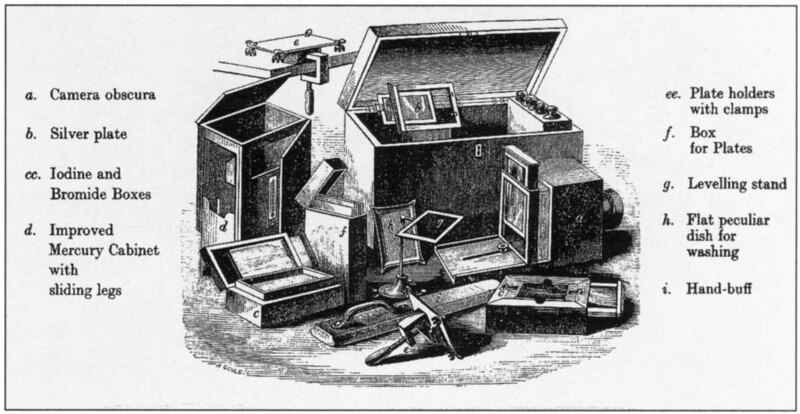 3] All of these medium-based constraints and potentialities, in addition to the aesthetic traditions out of which daguerreotypy emerges and the economics of daguerrotypic reproduction contributed to the kind of aesthetic artifacts that daguerreotypy creates. Conversely, the felicity of daguerreotypy to forms in light liberated painting to embrace a variety of ends divorced from the constraints of simulacra. The result has been an avant-garde based in increasing levels of abstraction and new forms of visual fidelity informed by, but distinct from, those attributable to daguerreotypy and the various photographic forms that have followed. Figure 3. Daguerreotype from an Advertisement, 1843. Figure 4. 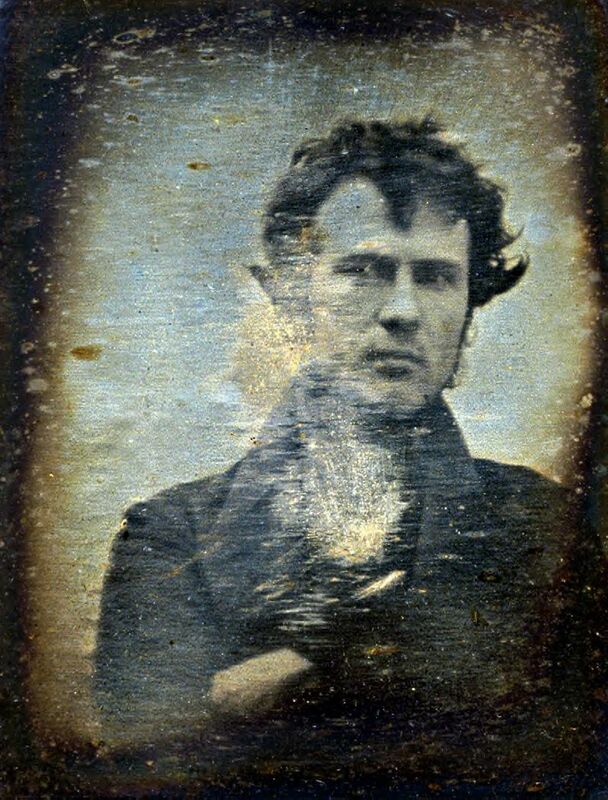 Robert Cornelius, Self-portrait, daguerreotype, 1839, Library of Congress. Yet, of all previous light-written technologies, there is a unique reciprocity between Polaroid and smartphone photography. This is because Polaroid represents the last analog iteration of photography leading up to the digital camera, and eventually the selfie in its current form. Like contemporary smartphones, Polaroid cameras were light-weight and easy to use, designed for a general public – as one Polaroid ad from 1977 expressed it, “Just press one button – that’s it! The motor hands you the picture. You don’t focus or set anything.” [Fig. 5] They also allowed photographers to instantaneously view their images. Figure 5. 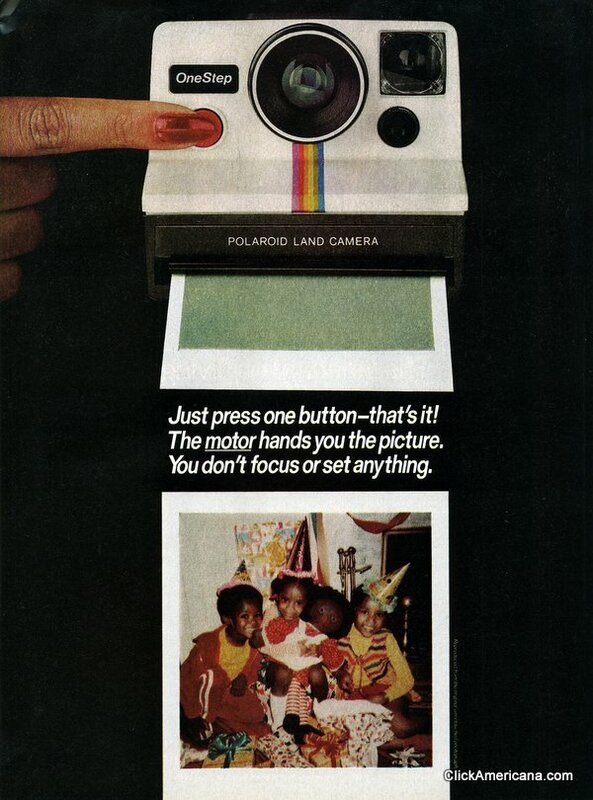 “Just Press One Button–That’s It!” Polaroid Advertisement, 1977. In doing so, Polaroid photography provided a vital bridge between the point of capture and that of presentation, while similarly addressing an increasing demand for immediacy conditioned by a culture of live broadcasts and telephonic communications. This integration of photographic reproduction and presentation prepared the way for the kinds of interpersonal engagements that have become indicative of networked digital photography. In this way, the Polaroid represents the final link between analog and digital photographic ecologies and cultures, and anticipates the emergence of the “selfie”. In Camera Lucinda, Roland Barthes argues that the presence of a camera performs a uniquely transformative role in the attitude and posture assumed by both subject and photographer. Each adapt to the situation of photography and the expectations that it imposes on its actors.16 The combination of production and consumption made possible through Polaroid photography expanded the performativity of the medium. Premised on the originary relationship between photographer and subject, the Polaroid image becomes an actor in the reconstituted context of its viewing. It thus inserts a recursive system into the primary, generative photographic act, which presents the possibility for further collective emergence. Thus, while the performance described by Barthes remained relatively constrained and well-defined (an instant, a pose, a posture, a place, a time, a capture), that of the Polaroid is indefinite, with actors posing, capturing, reviewing, reposing, recapturing, and reviewing, potentially ad infinitum. Translated into self-portraiture, the particular functionality of Polaroid cameras, like the SX-70 Alpha 1 (which includes a 2-3 foot focus corresponding to the average length of the human arm) enables the production of both individual and group self-portraits that are situational and reflexive. [Fig. 6] The latter is a consequence of the way in which these images can be reintegrated into the cultural matrix out of which they emerge, redefining group interaction and creating a recursive feedback loop in which camera and images become integral actors. It is precisely the role of the Polaroid image as an immediate agent of relational reconfiguration that culturally defines it as a medium. Figure 6. 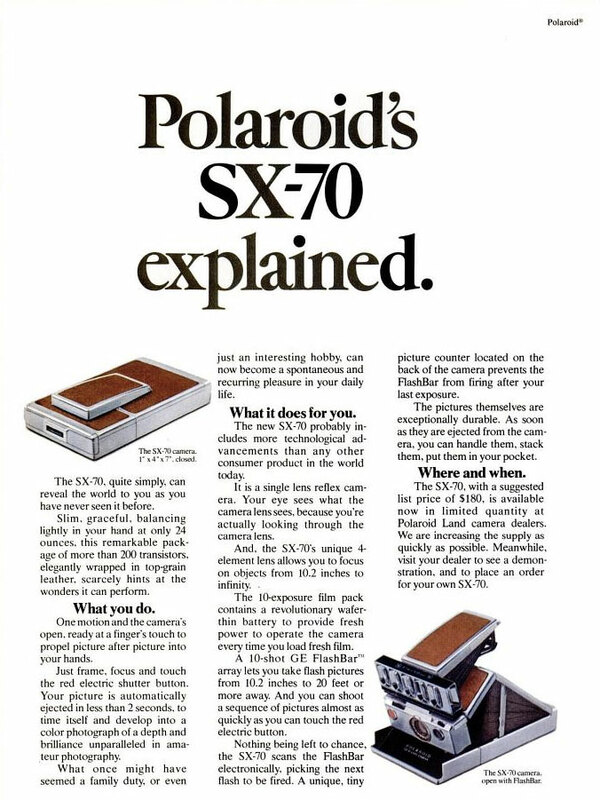 “Polaroid’s SX-70 Explained,” Polaroid Advertisement, 1973. The digital selfie exponentially extends the distinctive group dynamic of the Polaroid, making it readily amendable to systems of self-identification through group association and interaction. Within this inter-relational choreography of poise, counterpoise and synthetic emergence, the representation of the self is conditioned by the aesthetic composition of the image, the others included in or excluded from it, and/or the circle of people to which it is presented. The selfie thus refers to the imbrication and construction of the self within a network of actors. This self-constitution depends on either including others within the selfie proper, or permitting people within one’s social network to view, comment on and share the image once it has been posted. Figure 7. Kim Kardashian, Reflected Selfie, Instagram post, October 16, 2013. Selfies assume three general forms: the reflected self-portrait; the isolated selfie, in which the camera is turned to face the photographer-subject and the image is compositionally constrained by the length of his or her arm, the angle of orientation and the optical focus of the camera; and the group selfie, in which the angle of orientation and the optical zoom are maximized to include both the photographer-subject and the group of which they are a part at the time of capture. [Fig. 7, 8 & 9] With contemporary smartphones, which include inward-facing cameras that allow photographer-subjects to view images before committing them to memory, the latter two forms of selfies have taken precedence over the first.17 However, what makes the selfie distinctive is the way in which these compositional tools are informed by a specific associational imperative. Figure 8. 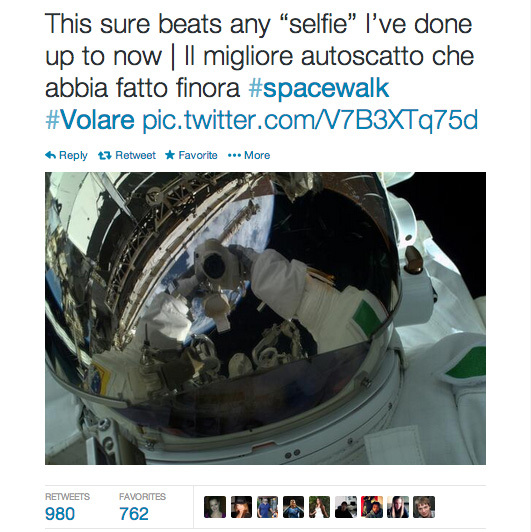 Luca Parmitano, Space Selfie, Twitter post, July 11, 2013, 12:04 a.m. Figure 9. 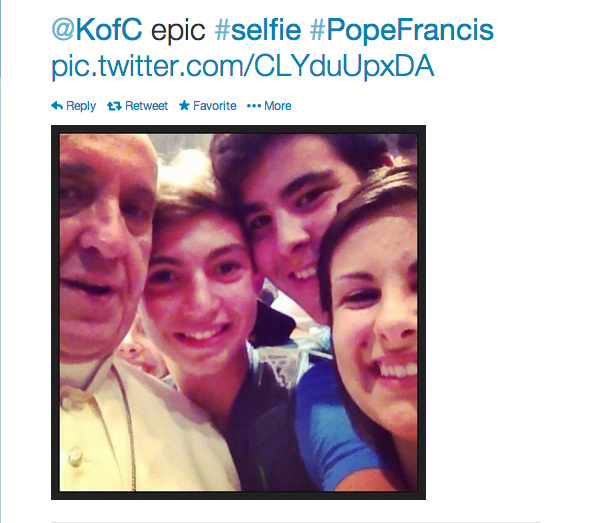 Fabio M. Ragona, Group Selfie with Pope Francis, Twitter post, August 29, 2013, 1:17 p.m.
As a result of this imperative, the selfie is not a self-portrait in the strict sense of the word, but rather the representation of the self as a product of the system of interpersonal relationships though which it is articulated online. The online presentation of selfies functions in a way similar to that described by the Russian literary theorist Mikhail Bakhtin in his analysis of the “dialogic” self. In Bakhtin’s writings, it is through the dialogic imbrication of the individual within networks of association that the self is alternately realized and transfigured.18 However, because dialogues are fluid, the nuanced adaptation of self that occurs through ecological interactions with others is fed back into the dialogic condition, resulting in the potential for unexpected forms of personhood. Figure 10. Dzhokhar Tsarnaev, Selfie with Black and White Filter, Facebook post, April 24, 2013. Figure 11. Recapitulated Tsarnaev Selfie with Effects and Cropping, Facebook post, May 23, 2013. Compositional techniques are similarly recapitulated through methods of conscious (or unconscious) mimicry, and evolve through the propagation of original selfies within networked ecologies. Acceptance, praise and approbation in online exchanges play an integral role in these systems of aesthetic recapitulation and differentiation.19 Comments, shares, likes and repetition function alternately as phylogenetic limitations on aesthetic originality, as well as impetuses towards ontogenetic emergence. The associative (or ecological) nature of social networking sites thus informs the aesthetic dimensions of the selfie.20This includes the articulation of self through ancillary systems of identification (profiles, product affiliation, tastes in popular culture, mutual friends, and so forth) and the locative functionality of contemporary smartphones. Each inflect online identities by reinforcing communities structured around shared interests, from popular culture icons, to specific brands, to activities such as pub crawls, biking, running, and yoga. We can share every second in data dressed in pixels. A billion roaming photojournalists capturing the human experience. And it is spectacular. In his 1959 essay, “Theory of the Derive,” Guy Debord castigated the habitual patterns that define the urban cartographies of city-dwellers. His ire fell primarily on a study mapping the movements of a young female student living in Paris. This report revealed a simple triangle, with points defined by “home,” “school” and “piano lessons.”21 For every smartphone or tablet owner today, there are maps much more detailed and accurate than that of the young French woman against which Debord railed. Reams of data are accumulated continuously by service providers, software companies, app developers and governments, including precise spatiotemporal information on uniquely identified users. This information is supplemented by online interactions. The images people post of what they are doing, when, where and with whom – all duly tagged with meta-data. Services such as Google Now cater to and reinforce the situational and location-based integration of digital and phenomenal interactions. ‘Now’ compiles data based on website histories (Google Chrome), internet searches (Google Search), emails (Gmail), social networking habits (Google+), location (Maps) and personal schedules (Calendars) to provide recommendations for local venues, traffic reports (based on scheduled meetings and one’s current location), package arrival updates and the means to connect with friends and associates in a single interface. Recognizing the potential monetary benefits of such pervasive access to people’s lives, companies such as Facebook are following suit, offering their own smartphone systems (Home), and attempting to match the level of integration currently accomplished by Google. The functionality of systems such as Now and Home reveals how digital data-streams feed back into interpersonal relationships, allowing users to locate, situate and interact with members of their social networks, both on- and offline.22 As a result, the selfie has become an increasingly exact, diffuse and contextually determined representation of individuals within highly articulated networks of actors.23 Conversely, via the agency of remote digital connectivity, selfies help drive the phenomenal situations through which they evolve, creating a synergistic system of recursion between digital and phenomenal collective ecologies and the articulation of self in each. Huxley’s triad conveniently corresponds to the scales of interaction exhibited in online environments. At the largest scale, the ecoclimatic, there is network functionality – the gross technological infrastructures that inform the potential for digital communication in terms of hardware, software and internet protocols.27 The ecotopic stratum corresponds to the interface-specific layer of app and website functionality that defines the types of interactions that might occur. Moving down the scale, there are the numerous and nuanced systems of connections between users, ranging from direct intimate associations to relatively loose, indirect affiliations – friends-of-friends, brand-based relationships, comment threads on videos, images, articles and other forms of ancillary communities. While all three scales affect selfie production, dissemination and modulation, the selfie’s primary milieu is the ecobiotic. At this scale, the selfie serves as an essential mechanism for online identity construction. It does this self-reflexively, by acting, on the one hand, as the public face of an individual, and, on the other, by modulating processes of individuation by absorbing the ecological stress of the online engagements carried on under its iconographic facade. The reflexive capabilities of the selfie (as actor and that which is acted upon) are as much premised upon its dialogic constitution within extended networks of self-identification, as they are by the unique ecologies in which they thrive. Now the temptation of the absolute mask (the mask of antiquity, for instance) perhaps implies less the theme of the secret (as is the case with Italian half mask) than that of an archetype of the human face. Garbo offered to one’s gaze a sort of Platonic Idea of the human creature. Within the carnivalesque of digital ecologies, the selfie is as much the mask one wears approaching strangers as it is the face one reveals amongst friends, with the lines between the two modes of presentation and association constantly shifting. In this respect, the selfie is both the “absolute mask” of Greta Garbo, and the figure of iconic humanity represented by Audrey Hepburn in the last section of Barthes’s essay.32 Selfies are thus both archetypical and individual, vacillating between the stability of convention and the variability of shifting ecological currents. Poses, postures and compositional techniques constitute the recapitulated typologies of self-identification that are ritualistically repeated in selfies generated by contemporary social media users. These typologies are the equivalent of gestural icons, situating individuals within distinctive personality sets and cultural groupings. As a result, the selfie-as-icon expresses an orientation towards the world that refers to well-established narratives rooted in codified aesthetic lexicons of self-representation. While the relationship between archetypes and stereotypes, between mythology and history might be blurred in contemporary western societies, the mythic instinct – the necessity to establish narratives that inform group identity and behavior – is no less strong. To don the persona of a well-established archetype is to thus engage directly with the core values of a civilization as they are expressed through the daily mythologies that constitute quotidian comedies. To identify with an archetype implies dressing the part and playing the role in such a way that one’s affiliation with established mythic typologies can be read and understood by others.38 It is through the enactment of these mythic types that such types subsist and evolve. As mask, the selfie not only embraces the foundational mythologies of a civilization and/or a time, but it has the capacity to alter existing typologies and originate new ones. The evolution of new archetypes can occur through shifts in the cultural imaginary that originate popularly. Sites such as Facebook, Twitter, Instagram and Tumblr serve as much as the repositories of personal histories as they do as the engines behind the origination of new cultural mythologies, and the archetypes that inhabit them. The proliferation of prototypical mythologies on popular social media sites is supported by the latters’ associative structures, which enable the viral adoption of emergent forms. This is why these pages hold so much import, both for the individual and for today’s collective, culture consciousness. It is through sites such as Twitter, Facebook and Instagram that future mythologies are being written small, the aggregate weight of which equaling or exceeding that of the more fixed formulae of traditional typologies. The subtle re-writing of these mythologies through their continuous reenactment, reinterpretation and reinvention can thus result in a radical restructuring of collective cultural consciousness via the inflection of the archetypes that structure behavioral norms. When I did my self-portrait, I left all the pimples out because you always should. Pimples are a temporary condition and they don’t have anything to do with what you really look like. Always omit the blemishes – they’re not part of the good picture you want. In July 2013, Rolling Stone magazine initiated a month-long media scandal by publishing a selfie of the alleged Boston bomber Dzhokhar Tsarnaev on the cover of its August issue. [Fig. 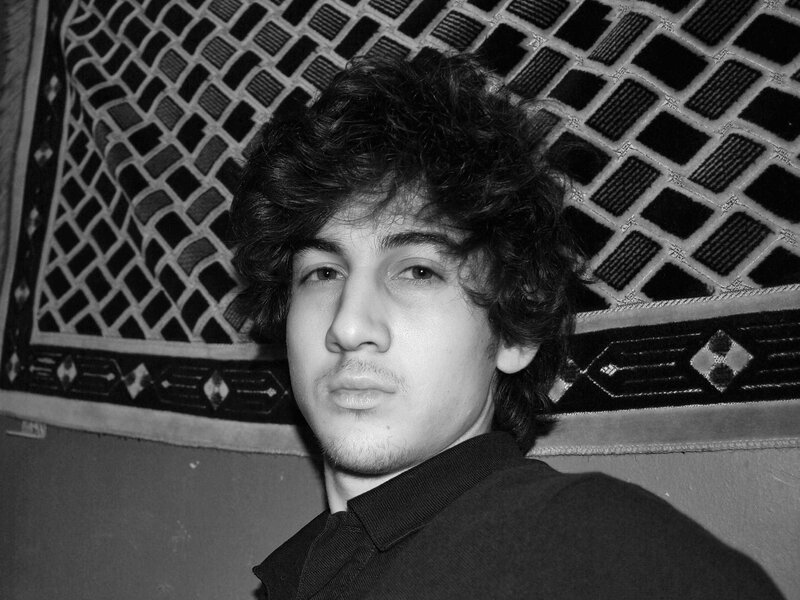 12] Tsarnaev’s original image has been cropped to meet the magazine’s format and is distorted by a noticeable linescreen. [Fig. 13] The latter is the result of pixilation caused by a combination of magnifying a low-resolution digital image for print and the four-color (CMYK) process traditionally used in magazine publication. The overall aesthetic effect is grainy and gritty, blurring and blunting the image, while symbolically referring to its amateur origins. Figure 12. 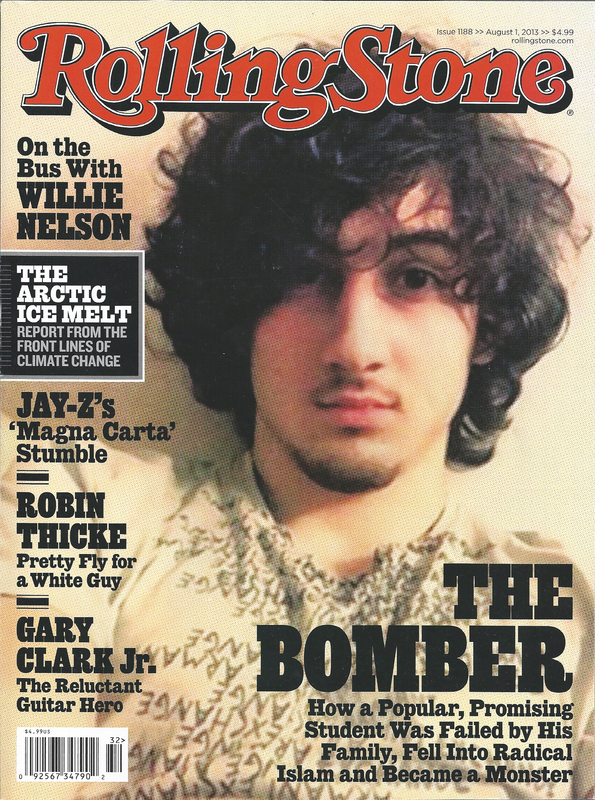 Rolling Stone, Cover with Tsarnaev Selfie, August 1, 2013. Figure 13. 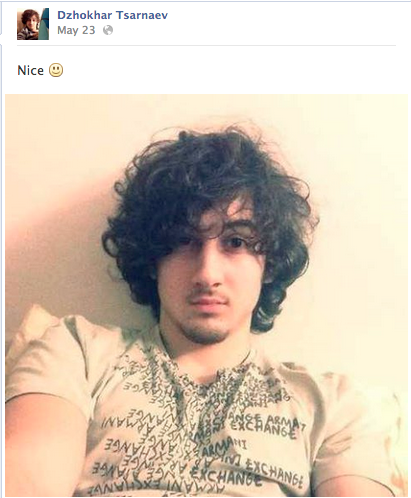 Dzhokhar Tsarnaev, Selfie, Facebook post, May 4, 2013. Figure 14. Screen Capture, Dzhokhar Tsarnaev’s Facebook Page Leader, accessed February 7, 2014. Figure 15. 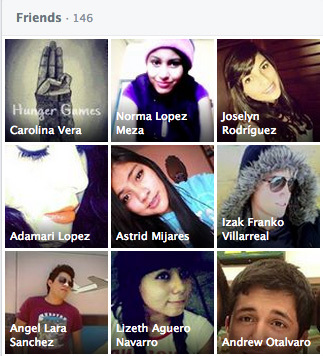 Screen Capture, Nine-square grid of Tsarnaev’s Facebook Friends, accessed February 7, 2014. Reviewing Tsarnaev’s friend and follower networks reveals a population dominated by young women, many of whom appear to be in their late teens or early twenties. Their profile pictures evince striking compositional (and thematic) similarities, as they smile broadly, purse their lips in postures of overt sexual innuendo (duck-lips), and emphasize their eyes and cheekbones through elevated angles of capture that simultaneously narrow their jawlines. [Fig. 16] These are performances of young-adult attractiveness, each one as unique as the individual behind the image, yet constrained by the compositional and aesthetic conventions that lend them thematic legibility. Figure 16. 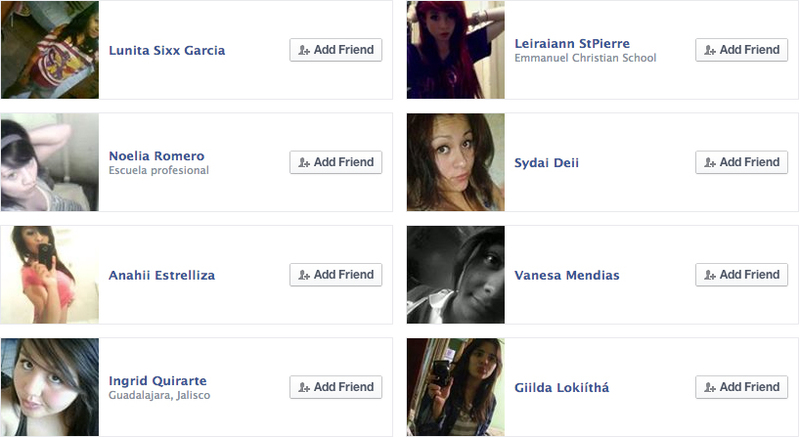 Screen Capture, Sample of Tsarnaev’s Facebook Friend and Follower Network, Accessed February 7, 2014. Thus the aesthetics of selfies are as indicative of the performance of collective character as they are a manifestation of individual identity. This identity is not an a priori condition represented through the compositional and stylistic techniques of selfies, but rather it is continuous with the aesthetic enunciation of the networked self embodied by selfies. Similar to the traditional half-masks of Italian carnival, the selfie acts as a point of oblique identification, through which alternative aspects of one’s personality might be explored and expressed within the safe environment of the carnival’s suspension of established mores, and behind the quasi anonymity of disguise. At the time of Rolling Stone’s publication, there were numerous Facebook pages and hash-tags dedicated to Tsarnaev, many of which either proclaimed his innocence or declaimed his guilt. Since then, many of these pages have been removed, and the few still active have remained relatively static since the brief period of intense activity initiated by Rolling Stone’s cover image and article has subsided. Many of the comments originally posted to these pages have also been removed by either site administrators or by the posters themselves. The dynamics of Tsarnaev’s social media pages reveal the dialogic instability of online identities, as users and administrators respond to content added to their posts and pages. The result is a fluctuating field of individual and group identities, as each adjusts to the ecological stresses imposed by the interactions of online communities. The kind of equivocation evinced by Tsnaraev’s pages, during which posts, comments and images have been published, revised and even retracted, is indicative of a formative stage in the constitution of online personas, as they are constructed in relation to the ecotopic dynamics of social media environments. Yet, as the remaining Tsarnaev pages attest, this kind of vacillation recedes as communities stabilize and as the identities informed by one’s association with them solidify. In the case of Tsarnaev, this has taken the form of a general neglect. Few posts are now being made to any of Tsarnaev’s active pages, and those that are frequently rely on and reinforce established narratives pertaining to both him and the crimes of which he is accused. 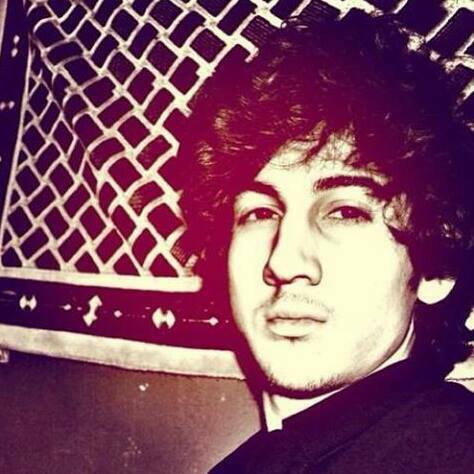 The calcification of narratives pertaining to Tsarnaev’s image exposes the exhausting effects of mainstream media interventions on the variations of identity performed through network ecologies. Mainstream media accounts (even those as nuanced as Janet Reitman’s “Jahar’s World”) rely on established mythic archetypes to make their subjects clearly identifiable to targeted demographics. These accounts generally conform to the recapitulated tropes by means of which intended audiences can classify the subject within an established pantheon of recognizable forms. Since the narratives promulgated by mainstream media outlets tend to fall within clearly discernable narratives, they feed back into the entrenchment of societal paradigms as they circulate across different media channels. In the case of Tsarnaev, the more subtle inflection of identity observed on the pages and posts dedicated to and about him in the immediate aftermath of Rolling Stone’s August issue have been subsumed by the definitive positions that the remaining pages and posts now advance. What is disturbing to Burr is the way in which deconstructing the selfie’s “meaning” is frustrated by the post-structural polysemy of Tsarnaev’s image, which is inexhaustible in terms of its possible interpretations. This semantic instability undermines familiar narratives, like that advanced in the series of images released by police photographer Sergeant Sean Murphy on 18 July 2013 in response to Rolling Stone’s cover, which show Tsarnaev battered and bloodied at the time of his arrest. Compared to the literal, documentary quality of Sergeant Murphy’s images, the Tsarnaev selfie is the equivalent of a blank canvas. It does not record any event other than that of its own taking.43 The way in which it is framed elides any reference to place or even time. Tsarnaev’s image floats implacably opaque within the placelessness and timelessness of contemporary digital ecologies, an artifact of an historical non-event, propagated across the non-places of communications networks. In a sense, the Tsarnaev selfie appropriated by Rolling Stone is pure mask; the mask of the selfie as such in its taking, of the image as the translation of light and volumes into a two-dimensional simulacra. Those who engage with Tsarnaev’s image similarly assume the various archetypes that have emerged in relation to the multiple mythologies that inform it. The performance of these parts and their ultimate transcendence is enacted through the mask of the extended selfie, which appropriates the narrative instabilities of Tsarnaev’s equivocal role through systems of association, integrating them within individual matrices of self. The dialogic inflection of these performances results in both the reinforcement of traditional archetypes and the establishment of new ones. Behind each mythic reiteration, lies the semantic instability of the image-as-signal set within the systems of recursions that describe its recapitulated constraints and emergent potential. Since the launch of YouTube in 2005, the means and methods for self-broadcasting have increased exponentially, driven in part by the popularity of smartphones, such as the iPhone (2007) and of social media sites, including Facebook (2004), Twitter (2006), Tumblr (2006), Instagram (2010) and SnapChat (2011). As the dates above suggest, each step in the development of networked mobile telecommunications devices, infrastructures, apps and platforms has contributed to the popularity of selfies from the first instance of the word in 2002 to today.46 It has been in large part the development of the ecoclimatic and ecotopic layers of contemporary digital ecologies that has technologically determined the preeminence of the selfie as a form of self-expression and construction today. Complementing this development are the cultural ecologies behind the selfie’s ascendency. 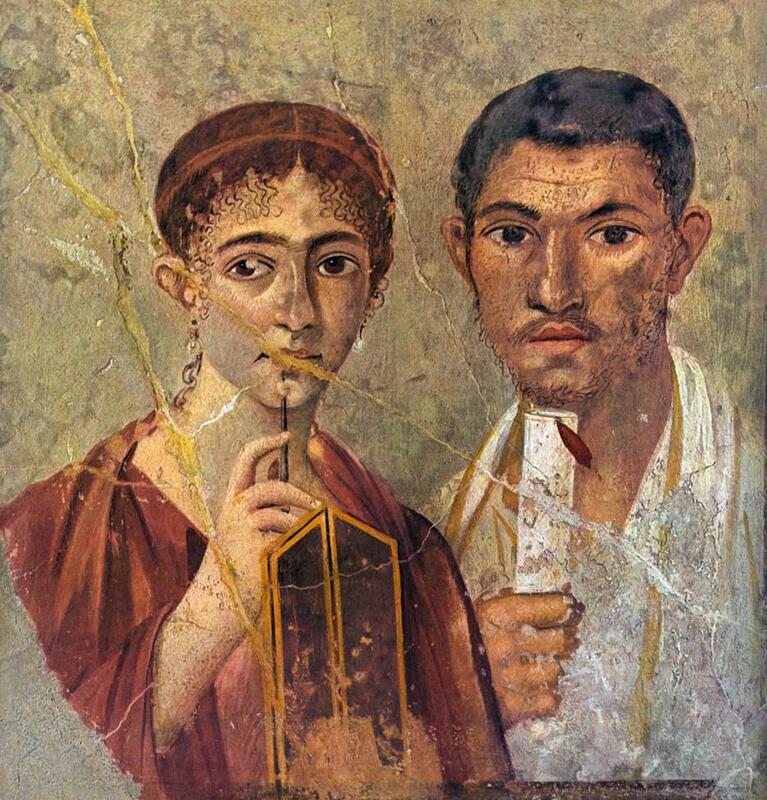 From the portraits of Pompeii, to Kodachrome slideshows, home movies, the unique relational dynamics of Polaroid photography and the digital selfie, templates for self-imaging and presentation have been established, persisting and evolvng hand-in-hand with emergent technological paradigms. [Fig. 17] The persistence of the products of self-presentation implies a deeply rooted cultural desire to construct images of the self and to present them to others. Selfies are an extension of this desire, expressed in the global terms of contemporary digital networks – brought out of the parlor and broadcast publically. Figure 17. Pompeii, House VII, 2, 6, Fresco. The historical antecedents of self imaging effect a certain aesthetic recapitulation, in which past forms developed through the combined influence of cultural mores and technological means are reiterated through their formal repetition in contemporary selfies. Conversely, the uniquely associative nature of selfies as dialogically inflected artifacts implies an evolution and extension of self-imaging cultures that consciously anticipate identification through affiliation. The self around which these imaging cultures have emerged has become an affect of the networks in which it exists. This results in the ambiguity evinced by the selfie, in which it serves less as a self-portrait, and more as a portrait of the self in the act of self portrayal, with the emphasis shifting from the representation of physiognomy to that of the kind of technological immersion implied by selfie production and distribution. This tension between physiognomic specificity and associative sublimation, between the individual and the archetype, can be seen in the inflection of self through the formulae of online formats, which alternately provide customizable templates, while reasserting the template itself as a form of brand association and identity. Accessing any page on Facebook produces the typical (phylogenetic) Facebook interface, with its iconic masthead and recognizable branding and layout. The visual, textual and contextual discrepancies between individual Facebook pages is further sublimated by the systems of recapitulation that inform online dynamics of self-presentation and maintain them within unique parameters, even as the dialogic and carnivalesque functions of digital ecologies induce subtle transfigurations in these systems of self-performance (ontogenesis). Yet, to be on Facebook, Google+ or even MySpace, to Tweet, SnapChat, or send Instagrams is to represent a process of GUI (graphic user interface)-based identification, in which the interface itself signifies a vital attribute of online identity. The interface is the message, even as that message is modulated through the ecological impetus of the iconic self – the ubiquitous selfie, which serves as both a means of individuation, and one of communal acquiescence. In this respect, the selfie is an individual enactment of the social and a dynamic aesthetic expression of the self as it is articulated through digital technique. Taken together, both interface and content evince an inclination towards conformity and an impetus towards evolution, indicative of the interdependence between origination and originality as it is enacted on contemporary social networking sites. Personalized webpages and feeds are thus equally unique and familiar; similar, but never the same, anticipating and anticipatory, revolutionary and reactionary, controlling and controlled. In this counterpoint of self-construction, the kind of brand identification provided by format standardization works to inform the identity of the user who chooses a specific site for his or her social networking activities. The interfaces of popular social media sites serve as the proscenia upon which today’s mythic dramas are played, with the selfie acting as the prosopon (lit., face) of traditional Greek theater. As prosopon, the selfie is both typical and archetypical, but unlike the gods and goddesses, heroes and demigods of Ancient Greek dramas, the selfie represents both the evocation of traditional mythic forms and the articulation of new ones, inflected by the digital ecologies in which it plays a principal part. Selfies thus incorporate the deep archaeologies of human experience symbolized in traditional mythologies, and serve as anthropological articulations of emergent mythic types based on the inflection of these experiences through the imaginaries of digital ecologies. This kind of fluid incorporation of ecological data into the matrix of the selfie not only serves to inflect online identities, but also affects the ecologies of which individual online personas are a part. In this way, the extended selfie is nothing more, nor less, than a diagram of socio-technological inertia and emergence. Each selfie is a unique window into the interminable dialogue between technological, cultural and visual traditions and their evolution within the discrete context of individual inflection. A selfie is the performance of self, freed by the carnivalesque atmosphere of digital ecologies to explore identity. It is also a sign of our capitulation to traditional memes, our desire to assimilate, to find communities that support our own senses of self. However awkward, the selfie represents the attempt to reconcile the contradictory forces of personal exploration and the desire for communal acceptance. As such, it is at once conditioned and conditioning, constrained and constantly evolving. The selfie exists in uncomfortable equipoise with the digital niches that it inhabits, equally resistant to and anticipating a future iteration of ourselves and the societies in whose emergence we play an important, if even only minor, aggregate role.